Five years ago, police officer Jayden Brooks changed into a werewolf as the result of being injured in a school shooting. The commander of Dallas SWAT keeps his eyes open for stories like Jayden's, and brings his finds into their SWAT organization made up entirely of werewolves. It takes some quick talking to explain their exemplary record, great speed, and healing abilities, but so far they are unsurpassed in keeping their city safe. Right after clearing a warehouse of fentanyl and numerous gangbangers, they get another call. If it wasn't for being werewolves, the loose fentanyl all over the floor might have killed them; as it is, their K9 dog is in trouble along with his handler who is with the Police Department and not a werewolf. Suddenly they are going to a school shooting, and they can see a teenager in a classroom with a gun pulled on the female teacher. It takes several SWAT members and Jayden kicking in the door and getting shot again several times, but the mysteriously attractive teacher is safe. Despite growing up in the part of town were gangs proliferate and the death of her older brother was due to gangs, Selena Rosa teaches high school in the area where she grew up, devoting her life to making a difference in her students' lives. Right now it's Ruben Moreno, who has been fighting to stay away from the gangs, and improving his reading skills the past months. Then that morning Pablo Garza starts teasing Ruben and then draws a gun from behind his back. Thankfully the neighboring classes call the emergency in to the office with all the screaming going on. Just when Selena might get shot by standing in front of Ruben, all hell breaks loose and SWAT comes in from the window and the doors. When she is taken away in an ambulance later, there is blood all over, but she has no injuries. It is high blood pressure and a fever that keeps her in the hospital for a few hours; that, and the memory of the hot SWAT officer who protected her from the gunshots. Jayden wonders whether Selena could be THE ONE, a werewolf's meant-to-be mate, because everything about her attracts him beyond reason. But then Selena starts acting weird; the other guys in the squad figure out that the trauma of the school shooting is changing Selena into a werewolf without her knowing it. The faster she changes the more dangerous it becomes, as it appears she is an Omega, a werewolf who has a hard time controlling their violence. While Jayden and his pack start to get more information on the people who are putting fentanyl into energy drinks, the closer Selena gets to changing without her knowledge. When Selena finds out what Jayden is and what she is becoming, is she going to freak out and refuse to even see him again? Secondary characters are the various members of Dallas SWAT including Zane and Selena's friend Becca; Selena's student Ruben, and Ernesto, Selena's brother's friend who took care of her after her brother's death all those years ago, but isn't who he seems. 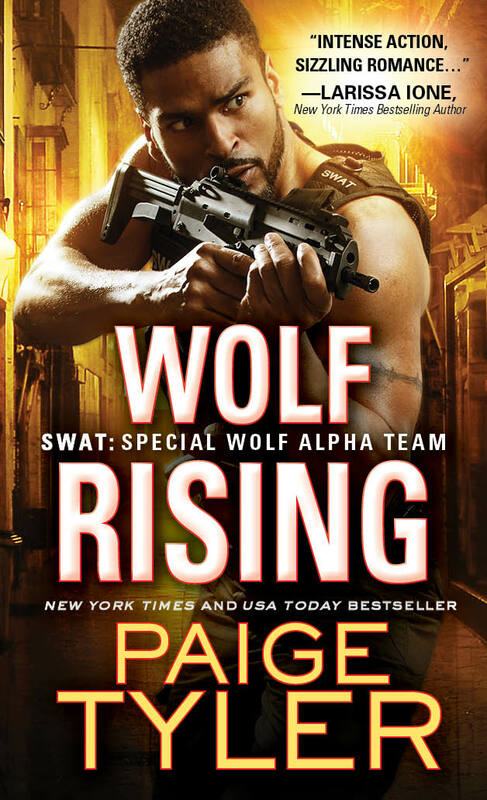 WOLF RISING is an action-packed story from today's headlines featuring the men of SWAT. Though other members of the SWAT series are in WOLF RISING, it is still a standalone story. Jayden must help Selena accept that she has become a werewolf, and Selena gives Jayden the unconditional love that every werewolf craves. Enjoy WOLF RISING this month as Dallas SWAT once again keeps their city safe.